Lawncare involves the proactive management of all plant life on your property. It sees elements of your yard such as grasses, gardens, ornamental vegetation, and trees as a unified softscape, not a collection of separate elements. Many of the individual lawn services we offer are similar to those that dozens of lawn care companies throughout the Houston community provide to area residents. However, what makes our landscape maintenance service unique is our determination to combine these services on a case by case basis that supports the landscape design in its entirety and pays proper tribute to the home as the preeminent focal point of every surrounding landscape element. Foundational lawncare procedures are those that focus on soil quality, optimal grass health and preserving front yard curb appeal. Lawn care services begin with the soil. As important as it is to keep the grass mowed weekly between the months of March and October, it is even more important to maintain the overall health of the yard. One of the biggest problems that we face in the Houston area is the problem of soil compaction. This condition makes it hard for grass roots to penetrate into the earth more than one or two inches. It also blocks water absorbency, which makes it difficult for grass to hydrate and contributes to drainage problems. Core aeration relieves this condition by removing cores of earth from the soil, which in turn increase its permeability and ability to support plant life. Concurrent to this treatment of the soil itself are turf services that can also be included in your lawncare and landscape maintenance plan. Sometimes it is necessary to simply start all over by replacing dead sections of the yard with new grass. More often, however, turf services allow you to diversify your lawn with more than one type of grass for a more dynamic visual impact. Fertilization and chemical treatments are two more foundational procedures essential to a well maintained yard. Typically these treatments are applied at the beginning of each new season. Landscape maintenance professionals carefully choose your fertilizer based upon the specific nutritional content of your soil. A little known principle of botany, known as the law of minimum, states that plant growth is impacted by those nutrients that are scarcest in a particular environment. Fertilizers that only target these deficiencies will actually stimulate more growth in lawn grass than retail equivalents that blindly dump large amounts of every type of mineral into the soil. Lawncare service also pays very close attention to other types of vegetation growing in your yard. Ground covers, flower beds, shrubs, and trees are just as much a part of your lawn as your grass, yet they are not always given top priority by lawn services companies. Our philosophy maintains that the yard is a unity that has to be treated as such. Just as diversifying grass plantings can double the visual appeal of a yard in less than one season, maintaining trees and ornamental vegetation on a regular basis will exponentially magnify the visual impact of the home. Many modern and contemporary style yards, in fact, consist mainly of ground covers as a drought-resistant, highly ornamental substitute for lawn grass. 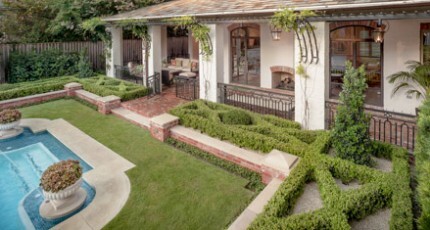 Other, more traditional landscaping designs use ground covers to accent the borders of the lawn in places where it converges with trees, gardens, structures, and the façade of the home itself. Professional lawncare makes it a point to keep ground covers neatly trimmed at regular intervals so they can appropriately accent the plain of the yard in proper scale and scope to the various elements they accent throughout the property. The same principle holds true for gardens and flower beds. These plantings add dimension, diversity, and multiple layers of vertical impact to the yard. Various garden maintenance services are performed seasonally, monthly or even weekly if a particular design calls for it. Mulch installation, vine training, regular pruning, dead-heading of flowers, and seasonal color rotation are just a few of the services we can itemize for your garden in your lawncare and landscape maintenance program. Trees are attended to at regular intervals with a variety of proactive services aimed at keeping them healthy and attractive throughout the year. Deep root fertilization and tree preservation procedures help trees face every spring from a position of maximized vitality. Regular pruning keeps trees from crowding the view of the home and transforms their vertical impact into a powerful, complimentary force that completes its curb appeal.